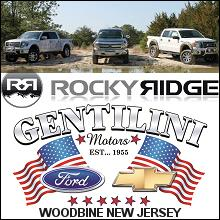 Gentilini Motors, a family owned and operated vehicle sales company, is extending their summer sales event through the end of August. 2013 leftover vehicles will be offered at special prices to make way for new inventory. The summer sales event will take place at 500 & 555 John S Penn Boulevard in Woodbine, NJ at the Gentilini Motors Ford and Chevy dealerships. 2 year recommended maintenance is included on new and certified pre-owned Chevy select models. The August summer sales event will also feature many lease specials on both the Ford and Chevy brands. More information can be found on Gentilini Motors website. The Gentilini Motors organization, located in Cape May County New Jersey, has been the new and used car dealer NJ residents have counted on since 1955. Family owned and operated, our NJ Ford dealer is legendary for customer service, winning Ford’s Presidents Award for Superior Customer Service over 15 years in a row. We have been making a name for ourselves at GM with our acquisition of a Chevrolet store. Our NJ Chevy dealer has successfully implemented our unique approach of family-style customer service. Please call Gentilini Motors for more information or any questions at 609-861-2629.